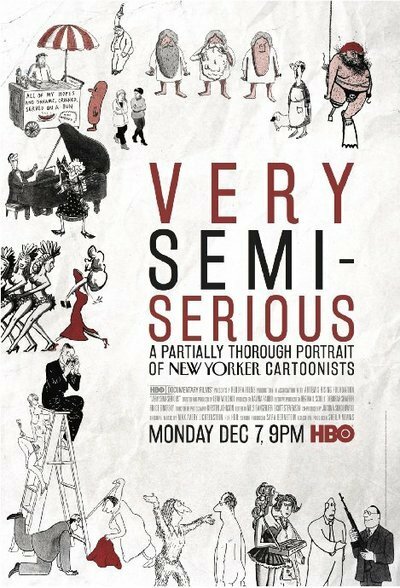 Catnip for writers and humorists of all stripes, Wolchok’s film provides delightful breakdowns of various cartoons, examining the comedic rhythm of their design and detail. Occasionally the camera will pan down an elaborate drawing before lingering on a succinct caption of deadpan understatement. Unlike “Wordplay,” Patrick Creadon’s 2006 profile of New York Times crossword puzzle editor Will Shortz, “Very Semi-Serious” is not limited to the story of one man and his many admirers. At a brisk 83 minutes, the film does live up to its tongue-in-cheek subtitle promising “a partially thorough portrait of New Yorker cartoonists,” though Wolchok does an admirable job of providing amble screen time for numerous artists—both veteran and aspiring—while enabling us to survey their distinctive styles (the most iconic of which belongs to Gothic satirist Charles Addams). At the center of the film, of course, is Mankoff, who resembles a grayer yet cheerier Joel Coen, and is credited with keeping his department relevant after taking over as cartoon editor in 1997. It was his idea to make the cartoons intergenerational by giving young people the chance to contribute their work, which tends to be inspired more by “Ren and Stimpy” than “Goofus and Gallant” (Mankoff asks one artist to dial back on the seemingly crack-fueled expressions of his characters). The emergence of female voices has also been key in subverting the publication’s predominantly male gaze. In an excerpt of archival footage, the head of twentysomething cartoonist Roz Chast is seen bobbing its way through a sea of men at a staff party, an indelible image worthy of its own caption. Chast has since become one of The New Yorker’s most prolific cartoonists, with taboo-busting peers like Emily Flake following in her footsteps. Flake considers the bullying and alienation she endured in her youth not only preparation for her career as a cartoonist, but a pre-requisite. Though the subjects remain acutely aware of Wolchok’s camera throughout, there is one instance of unguarded emotion where Mankoff and his wife recall the recent death of their son. Tears begin to flow as they explain that their recent change of houses was motivated by their need to escape painful memories that existed in every signifier of the past. For nearly a century, The New Yorker cartoons have provided readers with the sort of visual diversions that have made it possible for life to continue to be lived, even in the wake of unthinkable despair. We seek solace in them, and so do their creators. In one classic cartoon, a man is guided out of his bedroom by the Grim Reaper, while his wife calmly replies, “Think of it as one less thing to worry about.” Death will eventually guide us all out the door, but that doesn’t mean we can’t have the last laugh.